Arizona makes world class wine, it’s true. I didn’t set out to purposefully make Good Vitis about up-and-coming wine regions, but the phenomenal experiences that this blog has led to in Maryland and now Arizona are encouraging me to think more about that theme. Not as a focus of the blog, but more as a way of preventing myself from becoming a myopic wine consumer reliant on established reputation. To that end, this weekend myself and some friends will be tasting through two mixed cases of wine from Ontario, Canada, which will be written up for Good Vitis in the coming weeks. And, in May, Hannah (a.k.a. “The Photographer”) and I will be traveling to the Republic of Georgia with friends to, among other things, check out its 8,000 year-old wine scene. I’ve also covered wineries in California and Israel in these pages, and I’ve reviewed wines from Washington, Oregon, France, Spain and elsewhere, and will continue to cover any region where good wine is made. The newest region in which I’ve discovered good wine is the State of Arizona, where magic is fermenting. Our trip to Arizona was purposed around visiting my father, who lives in Phoenix. I’m out there several times per year. During one visit he took me to Jerome, a old mining town built on the side of a mountain, where Arizona’s most famous winery, Caduceus, is located. I did a quick tasting at their tasting room and popped into Cellar 433. Between the two I found surprisingly good wine that was mostly priced above its global equivalents. Those were my first and last Arizona wine experiences until a year or so later when friends of ours brought over a bottle of Caduceus, which had six years of bottle age, that was spectacular. It reawakened my interest in Arizona wine and I knew that eventually I’d have to make a point of trying a few more. That happened last month with visits to Arizona Stronghold and Fire Mountain Wines. Dustin Coressel, the marketing and sales guy at AZ Stronghold, and John Scarbrough, Stronghold’s cellar master, met us one morning at the winery, which is not open to the public, to show us around and pour a few barrel samples. AZ Stronghold is the largest winery in Arizona by production, producing around 20,000 cases annually distributed across twenty-five states. It’s also one of the oldest, and it’s role in the state’s industry is one of a grandfather with many a winery getting its start using Stronghold’s custom crush services, which include not only production but also in-house bottling and labeling capabilities. Their winemaking style is decidedly old world, and this is obvious not only in technique but in what comes through in the glass as well: open top fermentation, (very) neutral oak for most of its wines (using a mix of French, American and Hungarian barrels), incomplete malolactic fermentation for whites and vineyard management aimed at limiting the amount of manipulation needed in the winery. The terroir also helps. Arizona’s vitis vinifera is grown in the southern most part of the state, not far from the border with Mexico, which features a decidedly Mediterranean climate of long, warm days moderated by robust breezes, and cool nights. This combines to keep sugar development in check. The soils ain’t bad either, I’m told. Most of Stronghold’s vineyards – owned and leased – are around 3,500 feet in elevation, with their Colibri site at 4,250 feet, making it the highest vineyard in America by mine and Scarbrough’s estimation. I imagine most people are like me in conjuring up images of a 110+ degree, dry and stale climate in Arizona but there is considerable acreage in Arizona primed for grape growing. For barrel samples we tried their Nachise and Bayshan Rhone-style blends, both promising wines of character and structure. We also had the “Dolla” cabernet sauvignon, a refreshing and light cab with gorgeous red fruit, cinnamon and cocoa that retails for a very competitive $20, a very pretty and bright sangiovese and a gamey syrah. While the wine may be old school, Stronghold’s business model incorporates some new school components, notably a significant keg production. I’ve long been smitten with the idea of putting drink-now wine in kegs for restaurant by-the-glass menu; it just makes so much sense in that it preserves the wine for a long time, making it not only more profitable for restaurants but better for the customer as well. Kegs are also much easier, safer, cheaper and more financially and environmentally efficient to transport that glass bottles packed by the dozen. The practice has become quite profitable for Stronghold, which has gone a step further than any keg program I’ve seen by using reusable and recyclable kegs made from plastic, which makes transportation and storage easier, cheaper and more environmentally friendly that the normal metal kegs. Scarbrough and I geeked out for a few minutes at the end of our visit over vineyard management. Dormancy usually ends around March with harvest coming in August or September. The biggest dangers are Spring frosts and monsoons, which threaten the vineyards usually in July. Asked about brix at harvest, Scarbrough said that they aim to pick reds in the 23-24.5 range and whites as close to 22 as possible to preserve aromatics. Add this to the climate and wine making style and the results, which are detailed below in reviews of the wines I tried at their tasting room in Cottonwood and in bottle at home, are unsurprising in the high levels of quality, flavor, and elegance they deliver. As Dustin walked us out to our car he suggested that we visit Scarbrough’s side project, Fire Mountain Wines, whose tasting room was across the street from Stronghold’s. Why Joe didn’t mention it I don’t know, but the humility is a bit bizarre after tasting Fire Mountain’s stuff, which is fantastic. 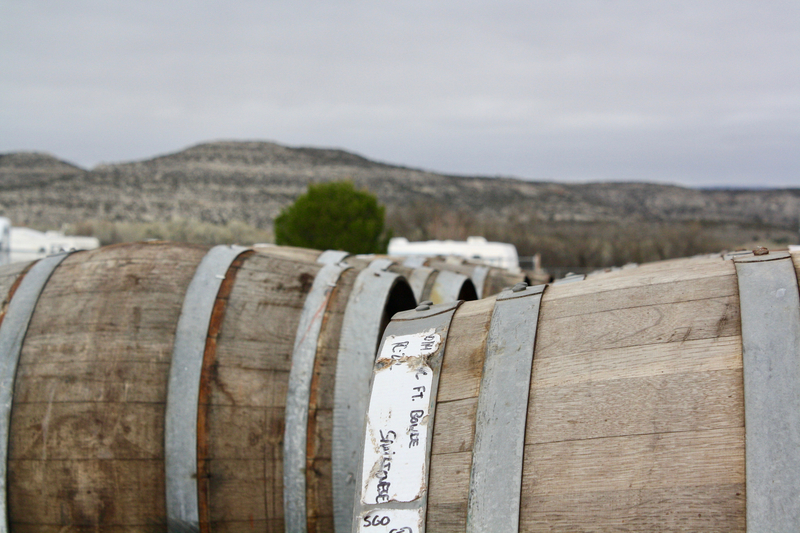 Fire Mountain is majority owned by a Native American business partner of Joe’s, making it the only Native American-owned winery in Arizona. I can’t recommend Arizona Stronghold and Fire Mountain Wines enough as great entries into the Arizona wine scene. Going through my tasting notes there did emerge some themes. Among the whites, bodies were usually medium and lush, but moderated by zippy acidity that is very citrusy and pure flavors. The reds, which as a group showed more complexity, were medium to full bodied but well balanced. They offered juicy acidity and good Earthiness to go with pure red fruits. Standouts included Arizona Stronghold’s mourvedre, the exceptional Dragoon Vineyard merlot (best in tasting), and Lozen reds, along with Fire Mountain’s mostly Malbec “Ko” and “Skyfire,” which is a hopped sauvingnon blanc (you read that right, and believe me, it delivers). The award for exception value is Arizona Stronghold’s rose which way, way over-delivers for its $12 price tag. The wines of both wineries are enjoyable, some age worthy, and all of good value. I highly recommend a trip to Cottonwood, which has become a hub for winery tasting rooms, for a representative taste of what Arizona wine offers. Great review thank you! I look forward to further reports when you head south to Sonoita and Willcox. One fun fact check I would toss to you is that Arizona has some Vineyards/Wineries at 5000ft+ in Sonoita and Wilcox. Thnaks agian and keep traveling and tasting! Sorry, it’s ‘Willcox’ AVA. I could kill autocorrect some times.